The PDF activity is used to quickly and easily embed a PDF document into your Android application. Your PDF document will be open external to your app in the Adobe Reader app. 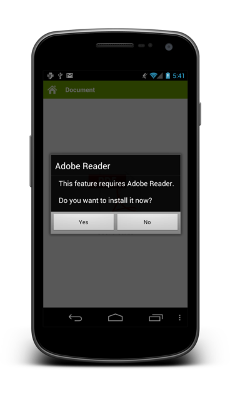 If the user does not have the Adobe Reader app installed, they will be prompted to install the app via the Google Play app store. The name that you want to give your activity, this will appear on the dashboard and on the Action bar. It can be whatever you want but should probably describe what it is used for. 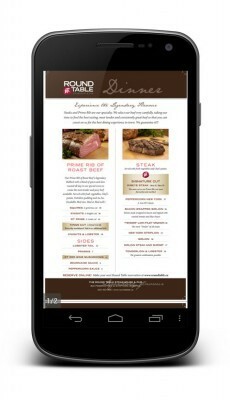 The PDF document that you want to add to your app. The maximum file size is 15 MB. Click the 'Browse' button to select your PDF document to upload. Note that this will add to the total size of your app -- if you're planning to publish your app in Google Play, be aware that Google Play only allows apps up to 50 MB in size. In general you should try to keep your file sizes as small as possible.